NEW YORK & LONDON & SYDNEY--(BUSINESS WIRE)--A cute commercial for Android featuring clips of unlikely animals playing together is the most shared ad of 2015, according to data released today by video ad tech company Unruly. “Friends Furever” - which depicts some surprising animal friendships - has attracted 6,432,921 shares across Facebook, Twitter and the blogosphere since its launch in February, putting it ahead of Disney’s “Surprise Shoppers” campaign, which took second spot in Unruly’s annual Top 20 Global Video Ads Chart. It not only makes it this year’s landslide winner, but also the most shared ad of all time - ahead of last year’s top ad, Activia’s World Cup ad “La, La, La”, which has attracted 6,094,762 shares across social media since its launch in 2014. In third place is a commercial created by Buzzfeed Video for Purina pet food about one man and his pup (3,021,499 shares), while ads for Budweiser (5th - 2,808,541 shares) and Kleenex (10th - 2,027,213 shares) continue the animal friendship theme. A heavily-disguised Cristiano Ronaldo dribbles his way into fourth place with an ad for his own line of headphones for Monster (2,995,849 shares). Three adidas commercials make it into the Top 20 - the most for any single brand. Unruly’s President, US, Richard Kosinski said: “We’ve been collecting and analysing consumer data on video consumption and sharing patterns since 2006 and one of the key drivers to video shareability is emotional intensity - how an ad makes a person feel. The Ad Council’s “Love Has No Labels” (6th - 2,743,138 shares), aimed at promoting diversity and inclusion, is one of eight campaigns supporting good causes to also make it into this year’s top 20. Other examples include a Microsoft video featuring Iron Man actor Robert Downey Jr giving a young boy a prosthetic arm (9th - 2,119,279 shares), an anti-domestic violence PSA from Italian newspaper Fanpage.it (8th - 2,365,612 shares), a Game of Thrones and Coldplay partnership for Red Nose Day (15th - 998,762), John Lewis’ Christmas cracker “#ManontheMoon”, run in conjunction with Age UK (17th - 693,343), and British supermarket chain Sainsbury’s festive ad “Mog’s Christmas Calamity” (19th - 629,720), which supports charity Save The Children. Unruly Co-CEO and co-founder Sarah Wood said: “Data analysis of 1,300 ads proves that 2015 was a highly emotional year for video ads. On the one hand, warmth and happiness shone through, with brands using fluffy pets and simple storylines to melt our hearts and amplify sharing. “At the same time, other advertisers aligned themselves with social causes, evoking strong feelings of sadness and inspiration. It’s not that Adland has lost its sense of humour this year; it’s just that it’s found a sense of higher purpose. The 2015 chart also shows a significant increase in social media shares from the previous year. This year’s top 20 attracted a total of 40,219,853 shares - a 38.50% increase from last year’s top 20, which generated 29,038,725 shares altogether. Ads for Samsung, DC Shoes, Supercell and Zorba, a Renaissance Studio based in India, also make it into the top 20. Unruly’s rankings are based on the number of shares - as opposed to views - that ads on Facebook and YouTube attracted across Twitter, Facebook and the blogosphere. As such, they are a measure of the ad’s online buzz or virality, ranking ads by the volume of active pass-on rather than the passive, paid metric of video viewership. Data was collected from January 1, 2015 to November 16, 2015. Data points were collected using Unruly Analytics™. 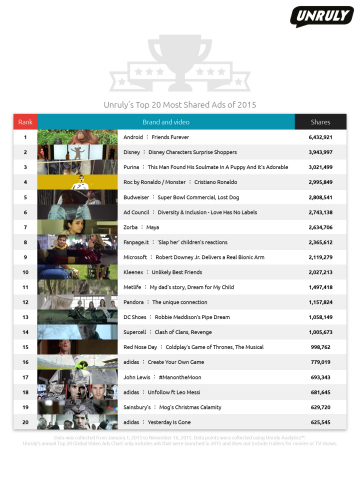 Unruly’s annual Top 20 Global Video Ads Chart only includes ads that were launched in 2015 and does not include trailers for movies or TV shows. UNRULY and UNRULY ANALYTICS and logos and associated marks are trademarks of Unruly Group. Other marks are owned by their respective owners. Unruly employs 200 people across 15 offices, with regional HQs in London, New York and Singapore.